The weekend hasn’t been sugoi at all with all of this news bits plaguing my feed reader. First, it was that Dragonball movie update. Now, this one on the upcoming live-action Voltron movie. Max Makowski, producer, writer and director, will be directing the big-screen Voltron adaptation. Well, perusing Makowski’s resume, he’s responsible for bringing the Today Show in Asia and worked as director for some episodes of Queer Eye for the Straight Guy. Oh yes. I now see it. 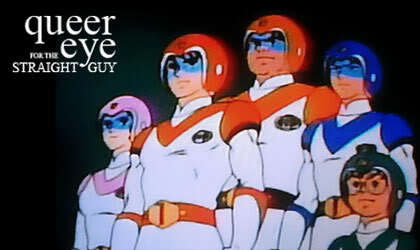 Five guys (scratch the princess babe from the team) in spandex mounting not robot lions but prancing ponies. Now that’s a movie! Anyway, to be fair to the guy, he is currently working on an adaptation of SHINOBI and is set to helm a movie adaptation of the TV series Kung Fu which featured my man David Carradine. I’m more interested with this last one. Kwai Chang Caine, mo-fos! I just don’t hope he doesn’t mix up his creative directions with any of these efforts. Casting crap: Hayden Christensen is Superman for Justice League movie? Who needs another Mortal Kombat movie? I love Queer Eye. I love Voltron. Putting them together will be weird, but who knows? The director might just pull it off.